Portrait of Niiya family composed of a couple and four smiling girls in dresses inside a room next to an open crate in Rohwer concentration camp, Rohwer, Arkansas, 1942-1945. Three smiling girls sit on a bench beside a mustached man with little girl in white dress standing in front of him. A woman in a patterned dress and eyeglasses stands to the back at left. 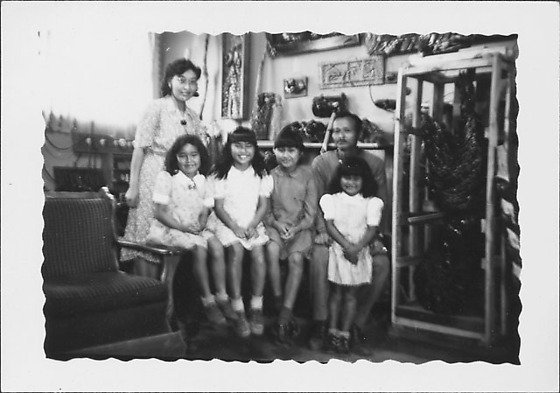 They are identified (left to right): Ruth Ayako Niiya (mother), Emi, Pat, Rhoda, Kamekichi Niiya (father), and Laura Mae (front). An upholstered bench with wooden arms and frame is partially visible at bottom left. Carvings and decorative objects hang on walls in background. Large unidentified carving, several feet high, is displayed in large wooden crate or box frame. Image has irregular scalloped border. Kamekichi Niiya worked in the maintenance department doing cabinet shop work during World War II and made all the carvings while in Rohwer, seven of which are in the Museum's permanent collection (2008.92).